Tom Edsall does a nice job summarizing the increasing hollowing out of the job market in his New York Times column today. 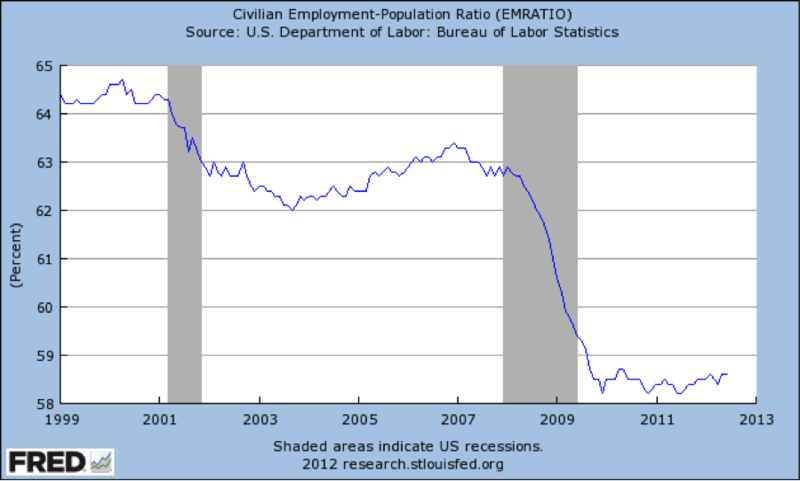 The employment/population ratio has fallen drastically since 1999 even as Real GDP hit an all time high this month. Edsall quotes Andy McAfee and me arguing that technological progress is part of the story for both these trends. Fewer people are working in America today than in the late 1990s, even though overall income is higher. James Hamilton and Amar Bhide are quoted by Edsall as being skeptical that the restructuring of the economy contributed to job losses. While Andy and I agree that the Great Recession is undoubtedly the biggest driver of the job losses since 2007, we also see a longer-term forces at work. In fact, employment growth was sluggish well before 2007. Digital technologies have advanced very rapidly in recent years. This can and does create enormous wealth. That’s the good news. But there’s no economic law that everyone will share in this wealth. In fact, as David Autor has noted, in recent years, the demand for middle skill jobs, involving routine cognitive and/or physical skills has plummeted. This is reflected both in wages and in employment. At the same time, those in the top 1% have seen their incomes soar. The median family actually has less income today than 15 years ago, even though the nation is producing more goods and services than ever before. 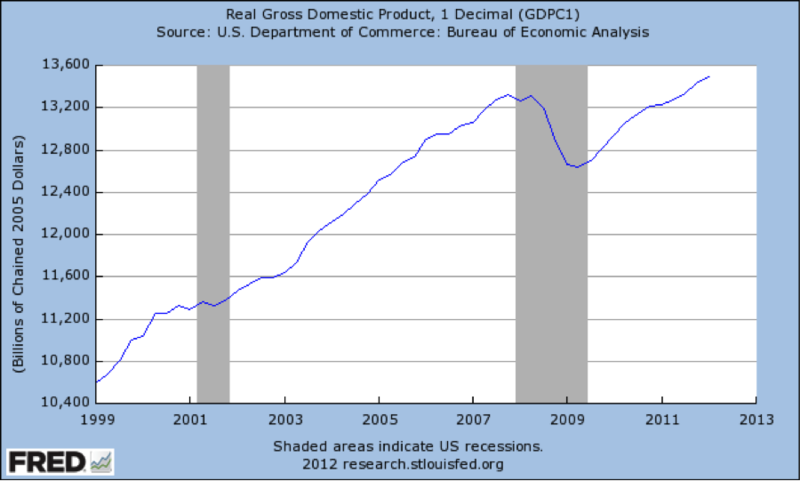 Of course, creative destruction has always been important to the US economy. 90% of Americans worked in agriculture in 1800. By 2000, it was less than 2%. This switch did not result in mass unemployment. Instead, new industries, from autos to computers, were created to employ people more productively. However, this time around, job destruction is happening faster than job creation, at least for certain types of workers. Demand for jobs involving routine work is rapidly falling since those jobs are the easiest to automate. As entrepreneurs discover and invent new ways to employ the laid off workers, the economy should come to a new equilibrium and re-employ those who lost their old jobs. However, even though the overall economic pie will likely grow, the new equilibrium may involve lower wages for many types of workers, and many may choose to drop out of the labor force entirely, as they have over the past decade. The first step to addressing the challenges of this great restructuring is correctly diagnosing it. It won’t do to assume that, just because things worked out in the past, everything will ultimately work out this time as well.